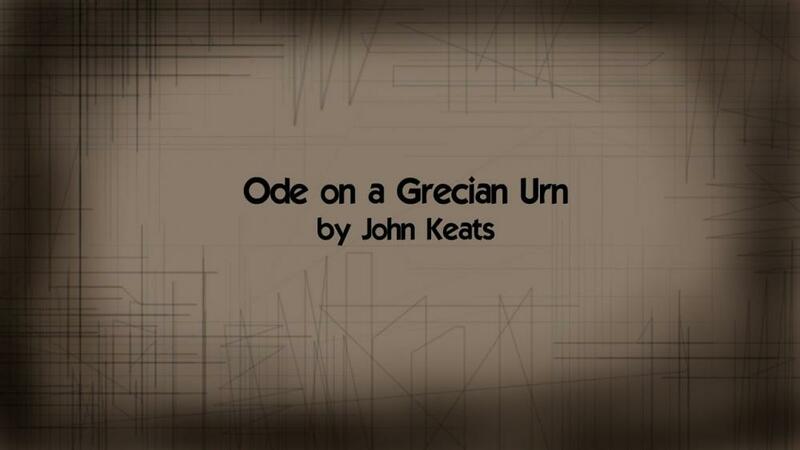 According to John Keats’s poem “Ode on a Grecian Urn”, the speaker tries to bring about a myriad of themes and motives in the poem. In this perspective, John Keats reflects on how death can be inevitable and expresses different views of beauty. Additionally, the poem revolves around pictures and figures frozen in urn. Accordingly, the speaker wonders about the frozen figures in the urn and comes up with many questions which remain unanswered to him (Keats 34). In the first stanza of the poem, the speaker wonders about the frozen pictures of a group of men pursuing another group of women. In this perspective, the speaker is baffled about what the pictures could mean. In addition, many questions run through the speaker’s mind of what kind of story it could be. The struggle of women to run away from men captures the speaker’s attention. In the second stanza, the speaker observes another picture of a young man together with his lover. In this case, the two are under trees’ shade and seem to have perfect time. Additionally, the speaker is quick to mention that the beauty of the lovers cannot fade though they can never kiss each other. In this perspective, the speaker compares the love of the two with the mortal love. Accordingly, in the third stanza, the speaker is happy that the trees will never shade their leaves like in the real life situation. Additionally, he perceives their love to be lasting forever unlike the mortal love (Keats 58). On the other hand, the speaker looks at another picture of a heifer being led by a group of villagers to be sacrificed. He is curious about the proceedings of the villagers and where they are heading. In addition, he thinks of a town which has been disserted and says that the streets of that small town will ever remain to be silent. In the final stanza, the speaker takes time to address the urn itself and the way its presence will act as a remainder of the past to the future generation. According to “Ode on a Grecian Urn”, the speaker manifests scenes in which there are different figures and pictures. In this perspective, there is a comparison of various figures in the scene with the mortal figures. Apparently, living in the urn is compared to living in the real world. In this case, the speaker puts it clear that beauty in the urn never ends. According to the first stanza of the poem, the speaker is faced with many questions concerning the figures in the urn. The figures in the first instance show a ‘mad pursuit’, which involves a group of men to pursue a group of women. Additionally, the pictures in the first stanza intrigue endless questions of their behavior. In this perspective, it is clear that the speaker of the poem tries to figure out where the people are heading and more of where they are coming from. Additionally, the reason of men’s pursuit is a disturbing issue to the speaker. Therefore, the speaker finds it tricky to have all the answers of the first picture and abandons it (Keats 24). In another case, the speaker comes across a picture of a young man under a tree with his lover. In this instance, the speaker derives a myriad of opinions about the trees and the young man’s love for his lover. Additionally, it is in this stanza where the speaker figures out some meaning of the pictures on the urn. For instance, the picture of a young man in this perspective implies that their love is endless. Unlike the mortal love in real life, the young man’s love is said to last forever. On the other hand, the tree leaves in the urn never shade implying eternity. In this case, it contradicts the real life situation where trees shade their leaves. However, the figures in the urn imply an eternal life and the way death cannot be escaped in the real life (Keats). From the other perspective, the speaker is caught in between a picture of villagers who are leading a heifer to the altar. In this case, there are divided ideologies extracted from the pictures. For instance, the speaker tries to think of origin and destination of the figures mentioned from the first stanza to the final stanza. On the other hand, the speaker thinks of a deserted small town where citizens have abandoned their city. According to Keats, people of this small town will never come back to their homes again. However, the speaker is also faced with questions about their destination and their reason of abandoning the town. Additionally, engagement with the urn makes the speaker come into terms with the real situation about the figures and pictures in the urn. According to the “Ode on a Grecian Urn”, the urn is quite different and separate world. In this case, the urn can accommodate mankind and various things. However, their interaction with the urn can never be mortal. The final stanza of the “Ode on a Grecian Urn” tries to put together all about the other three stanzas in order to come up with a solid conclusion. Accordingly, the final stanza tries to bring out the urn and mankind addressing each other. In this case, the urn knows very little of the urn unlike human being. Therefore, it is clear that only individual perception and interpretation of beauty and truth matters (Keats 11). In conclusion, the “Ode on a Grecian Urn” has a myriad of interpretations and meanings depending on individual perception. Accordingly, the poem revolves around the author going through several pictures and figures in the urn. In this perspective, there are different instances put into the light for the speaker. For instance, the first time when the speaker looks at the picture of men in pursuit of women, he asks himself many questions concerning the activity. On the other hand, the pictures on the urn seem to reflect the accommodative nature of the urn to mankind. Additionally, contradiction between the pictures in the urn and in the real life situation is brought under speculation. In this case, the speaker talks about the young man’s love which lasts forever. In addition, the trees in the urn do not shade their leaves unlike in the real situation. Therefore, in the second stanza, the speaker is able to bring out the meaning of the pictures and figures as he progresses throughout the stanzas (Keats 23). In this case, it is evident that the poem tries to bring about the theme of inevitability of death and the implication of beauty and truth by individuals. According to the poem, death cannot be cheated, and thus it is a must. On the other hand, beauty and truth is all one thing since they only vary from individual perception and meaning. In this case, beautiful things will live forever unlike mortal beings, whose beauty vanishes with time. According to the poem, musical instruments like pipes have been used in order to bring out sense of music from the poem. Therefore, it is clear that the speaker has brought out different themes and motives in the poem in order to contrast objects in the urn and mortal beings. Keats, John. Ode On A Grecian Urn And Other Poems. New York: Kessinger Publishing, 2004.Print.